I like Rhonodendrons – they look lovely albeit being quite temperament. When I lived in the country with a bit of land, we used to have a kind of cottage garden (although it’s more a jungle) with Rhododendrons in different kinds and colours. When we have moved into town, we do not have a luxury of land so we opt for smaller kind of Rhododendrons – tropical Vireyas. Saying that, we do not have any regret moving to smaller plot of land since it means less work around the field and more time in the tiny garden. We do not need ride-on mower. No backpack weed-control spray or fence maintenance every 3 months! Our country home served its purpose when we had several young rescued dogs. Vireyas are quite hardy as long as we don’t have frost too often they seem to thrive. They don’t mind being water deprived for a period of time and when they have their first rain or water they will produce prolific blooms within a few weeks. 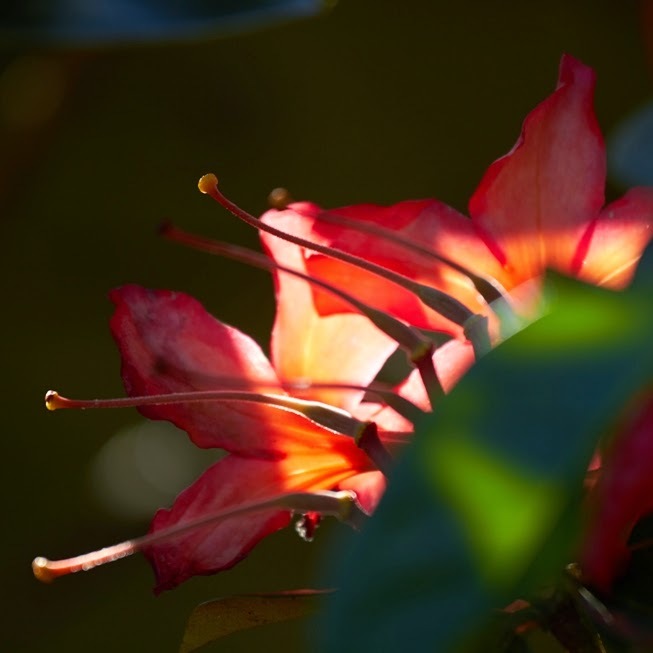 My favourite Vireya is Captain Scarlet – with its deep coral red flowers. We have several in our sub-tropical garden and they seem to flower all year round even in winter. They don’t need much room and respond well to being dead headed and pruning.